Restrictions and outages are ongoing. 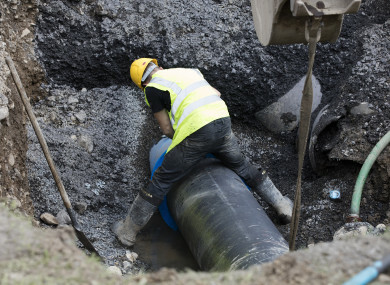 IRISH WATER SAYS that water interruption and will continue for “a number of days”. In all just over 20,500 people are without water and an additional 47,000 have restricted supply due low levels in reservoirs after last week’s severe weather. The weather led to a 10% increase in demand from Friday to Sunday in Dublin, leaving reservoirs significantly depleted. A statement from the utility today says that the decision to restrict water pressure around the capital between 7pm and 7am was not made lightly. “Irish Water had to act to protect homes and businesses in Dublin and avoid widespread outages in the capital. The decision to reduce pressure across the Dublin network for a 12 hour period was one that was not taken lightly but we needed to ensure the city continued to function. “We are aware that some people were without water entirely and we will review with water engineers across the Dublin Councils today to see how we can minimise this impact. Irish Water says that burst pipes due to freezing have played a larger part in the outages than people leaving their taps running. “In Dublin three major bursts in the North Docklands, Infirmary Road and Skerries were wasting the equivalent of the daily water usage of Balbriggan which has a population of about 25,000. These have now been repaired. Those without water are include almost 2,000 in Cork, 7,300 in Wexford, and 12,250 in Tipperary. Those on restricted supply include 500 in Cork, 16,500 in Galway, 300 in Kildare, 16,500 in Leitrim, 700 in Mayo, and 12,500 in Meath. Just over 14,000 people are on storm related boil water notices. A ‘do not drink’ order has been issued for people on the Fethard public water supply system in Co Tipperary due to hydrocarbon contamination of the source. Email “Why are people without water? Three burst pipes were wasting enough to serve 25,000 people”. Feedback on “Why are people without water? Three burst pipes were wasting enough to serve 25,000 people”.